I was watching the Atlanta Braves’ playoff game Sunday night against the Los Angeles Dodgers with a lady friend, and, as usual, Braves’ pitcher A.J. Minter was wild. His pitches were landing everywhere but in the strike zone, an affliction that has bedeviled him and other Braves pitchers all season. I was trying to explain why it was so frustrating, how it’s been going on all year, how these guys are professionals and ought to be doing their job better. My friend’s response was that it’s easy for someone on the sidelines to be critical, and that Minter was doing the best he could. She was right, of course, but for sports fans there is a certain tolerance for booing and criticism as well as for cheering and praise. 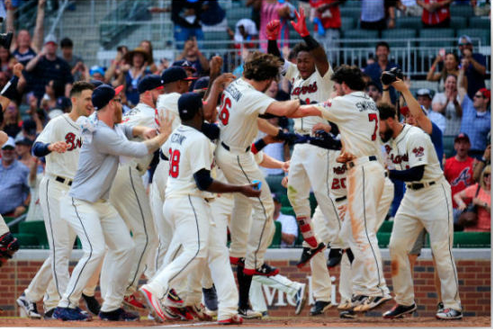 To be a fan, generally speaking, is to commit oneself to hope and expectation — after all, “fan” is short for fanatic — and over the past several years the Braves have been disappointing. This year, however, they have been far better than expected. That they are even in the playoffs is a miracle. But being a fan, I’m greedy for more. I want it to continue, I want the players to be at their best, right through to the storybook ending and winning the World Series. I also know that’s unrealistic. It would be a glorious ending to a terrific season — walk-off home runs, amazing defensive plays, a brilliant supporting cast and team celebrations so riotous and exuberant you couldn’t help but feel part of it. So it was gratifying to see quick shots on TV of fellow fans in varying degrees of anguish as the Braves eked out a victory. This was my tribe — or one of them, anyway — and I was surprised at how much better I felt at seeing others experiencing the same emotions I was feeling. That’s the fun of being a fan. That doubt, that pessimism, that expectation of disappointment, didn’t just show up overnight. It’s a lifetime habit. I’ve felt it everywhere I’ve lived — Michigan, Rhode Island (twice), Connecticut (twice), Kentucky, Tennessee, Hawaii, Georgia. It’s a legacy, an heirloom passed down through the family like grandmother’s dishes, black-and-white photographs and scarcity thinking. Pessimism was embedded in the consciousness of my parents and grandparents from their own experiences and by the Great Depression. So, if the Braves falter and fall, that’s the narrative I grew up with. And it would be true regardless of what I was observing, whether an athletic event, a public speaker, a surgeon in the operating room, a lawyer in court … all judgment is a reflection of the one who judges. This is where it gets uncomfortable … and hopeful. The emphasis in “How are you doing?” shifts to the verb, and wisdom arises from a pair of aphorisms. As a fan, I have no control over my team. There’s nothing I can do to help Minter or Newcomb or Toussaint or Gausman throw strikes. I can’t help Camargo hit even a foul ball, for crying out loud. I am a victim of my expectations. A willing victim, to be sure, but a victim nonetheless. But in terms of “doing” I am also the action figure. And in that sense, pointing at Minter is an invitation to look at my own job performance. And — hello! — I’m not doing that well. I’ve got a manuscript to send to a writer who has generously offered to read it. I’ve yet to start the final chapter of that book. I’ve got two other projects awaiting my attention, and a request from an editor looking for stories. I’m not throwing strikes, either. Move over, Minter, you’ve got company. I’m not trying to take the fun out of spectating; too much navel-gazing will make anyone dull and uninteresting. But taking care of my own business can do a lot about the way I feel about myself and the Braves. Then I can watch without complaining, and appreciate what a great year it’s been. This entry was posted in Uncategorized and tagged A.J. Minter, alcoholic, Atlanta Braves, baseball, Camargo, Dodgers, fans, Gausman, Newcomb, pessimism, playoffs, solution, taking care of business, Toussaint, victim on October 8, 2018 by John Christensen.